Apparently, developers behind Sickweather had the same train of thought just before they envisioned their creation several years ago. 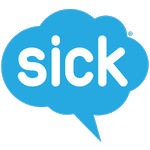 Sickweather’s CEO Graham Dodge was looking for Twitter users in his approximate vicinity to see whether they reported symptoms of a virus he was trying to diagnose himself with. He found a friend nearby who reported exactly the same symptoms, and so, the idea of scanning or monitoring social networks to map illnesses was born. A few years later, an iOS app Sickweather landed on iTunes, and with the media buzz that accompanied it, the app quickly gained traction. Now that the app is successfully ported to Android you can install and use it for free, no in-app purchases to enjoy its benefits fully. I have tested Sickweather, and here are my impressions. First of all, the app wants a lot of permissions. All of them are perfectly understandable when you take a look at the app’s functionality. For example, you can email, text, or send a Facebook message to your friends through the app. Hence, the access to Contacts permission. Then of course the location permission since the app needs to pinpoint you on the map of your area, so that you can receive relevant notifications, or report Sick anonymously. As a result, many users complain about the extensive permissions, and leave negative feedback. I would suggest Sickweather update the app’s description with a detailed explanation and justification of each and every permission the app requires. That would answer the users concerns and be quite fair to privacy and security concerned users. No, that would be fair to all users. My second observation was when I logged in without pinpointing my location, I could see the world map, and one thing became evident – the app is US-exclusive, for no other country had any Sick bubbles on its map. I might have done something wrong, or this could be a glitch, but only the US map had illness reports on it. If this is the case, the app needs to wear it in its sleeve – US-only. The interface is quite intuitive. You can zoom in and out of the map, search for locations (although that particular feature failed on me – there was an input field, but no search button, so I could not search – a bug?). 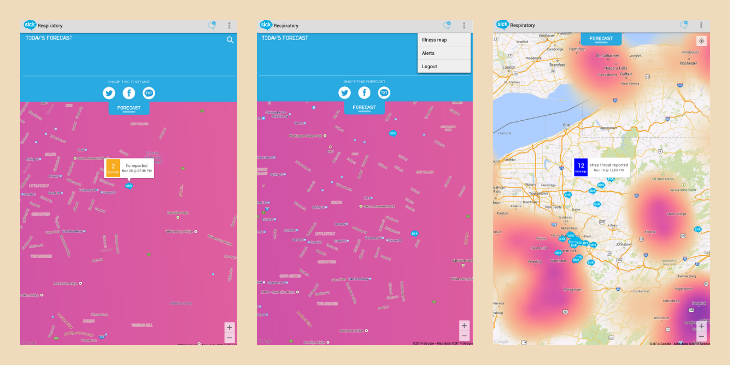 Also, you can switch between four different map filters based on the character of the illnesses – environmental, childhood, respiratory and gastrointestinal. Also, there is a list of common illnesses like flu, chickenpox, asthma, allergy, and so on – more than 30 of them, if I am not mistaken. So, you can report those if you should fall ill. The map itself looks colorful, which means people report being sick. The colors stand for the time when the illness has been reported: Red – one day ago, Orange – 2 days, Yellow – a week, Blue – 2 weeks. Now, this is important because some viruses remain on surfaces, like door knobs, for as long as two weeks. Say, the app notifies you a school near your favorite supermarket has been shut down due to stomach virus epidemic. You might change your route and go to a different supermarket, or grab a hand sanitizer with you if you choose to stick to your habits. Better yet, you might choose not to take your kids with you, and shop solo – quickly. 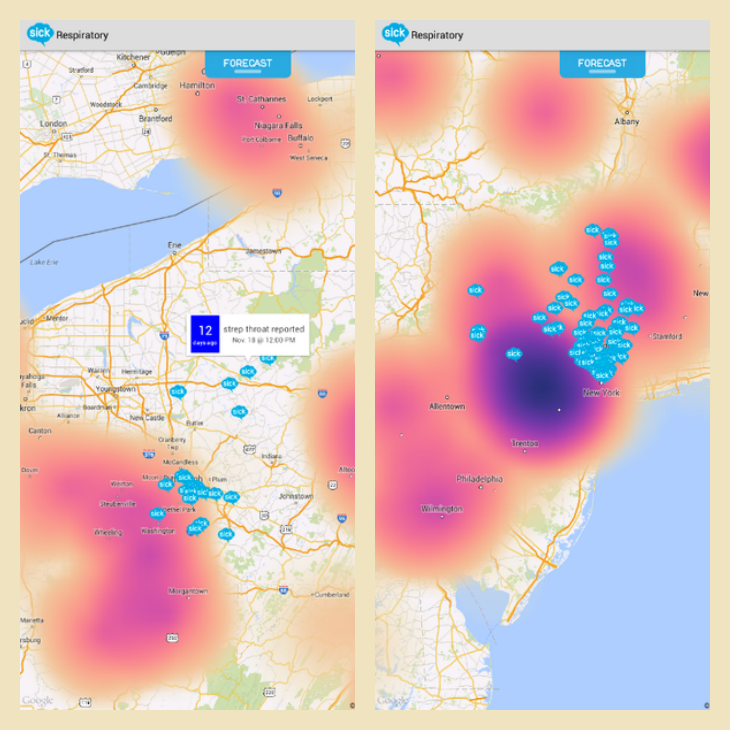 The app sports a Spartan design, but it’s not supposed to distract you with Material bells and whistles when you are looking for flu cases in your neighborhood. What I did find challenging was the font size – it is really small, and sometimes I had to squeeze my eyelids to make out some menus. Also, the color coded bubbles on the map turn into the colorful fog when you zoom in on the Sick area. This is especially true when there are several cases of the same illness reported, and the app generates a color-coded hurricane in the danger zone. It helps to point out the areas of epidemic spreading, but doesn’t help when you zoom in. You can set up alarms, or notifications, too. To do that, you will need to enable location tracking, and either select illnesses you want to be notified of, or select them all. For the notifications to work when you are on the move, your device needs to have GPS enabled. Doh. That still drains the battery, so you might be turning that on occasionally to scan the map, but running with GPS always on is still a challenge to smartphones. Sickweather is using a patent-pending algorithm that scans social networks for user reports of illnesses. It is smart enough to weed out ‘Bieber fever’ from ‘high fever.’ It also relies on the community of its users, who report being sick anonymously. That is why it also wants you to log in with your Facebook – to monitor your friends’ Sick reports and notify you. Yes, my first reaction when the app suggested I log in with Facebook was ‘and you, too?’ The good part is that you don’t HAVE to log in with Facebook, and can register an account that would tie into your email address. However, I am mustering the idea of a Facebook tie-in, and let me tell you why. I have this friend, who is a great guy, but somewhat immature. He doesn’t handle constructive criticism too well, and he never tells you whenever he is sick. He also works in a hotel, and happens to catch all the possible flus in a season. He ended up putting my entire family off the radar five times in a single year, and the last time, I asked him to give me a warning when he comes visiting with a runny nose, so that I could at least send the kids off to a playground. As you might have guessed, he got offended and went mute. Had I had Sickweather, or had hotel people used it, I would have been able to predict he could have been sick, or the app might have weeded out from his boss’s Facebook that he, too, was off sick. So, I am not overly inclined to criticize Sickweather for tapping into your social networks, your Contacts and your location. If you come up with a better idea to generate those reports, feel free to share them in the comments section below, or better yet, make an app. The app crashed a few times on my Samsung Galaxy Tab 3, and the zoomed-in map loaded a bit longer than I excepted, but those are minor rumblings. All things considered, Sickweather is unfortunately a necessary disease prevention tool these days. Its major problem is the people – the irresponsible and egotistic kind, who like to go out and cough on others when they are sick. Those will never report Sick in the app. On the other hand, there are millions of sane and responsible citizens who report being sick to prevent the spreading of the disease. 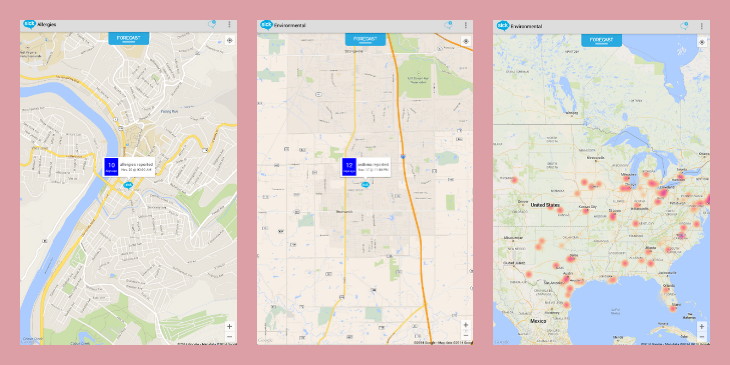 Those make it possible for Sickweather to map the flu, norovirus or seasonal allergies on the map of your neighborhood, and notify you should more reports appear. Or, you could scan the area you are going to visit on a business trip, and be prepared. 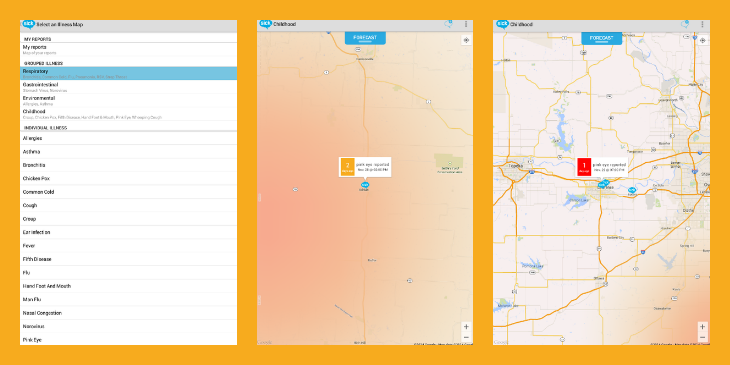 Also, when you report sick, it shows on the map anonymously, unless you post it on your publicly available social network account. Better yet, you can spread the word among your family and friends. 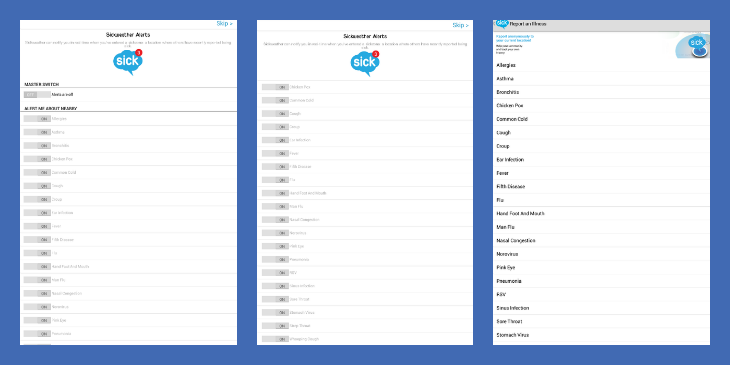 Sickweather is yet another social app and yet another health tracking app, but unlike many others in the niche, it MAY help you prevent yet another flu. 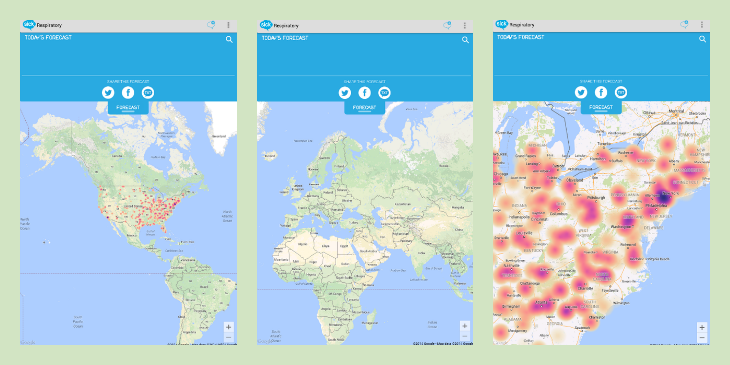 Sickweather is yet another social app and yet another health tracking app, but unlike many others in the niche, it MAY help you prevent yet another flu.